Sunbird, Handsome Sunbird and Lina's Sunbird are endemic to the Philippines. because of their shape, are simply punctured at the base near the nectaries. Fruit is also part of the diet of some species. Their flight is fast and direct on their short wings. 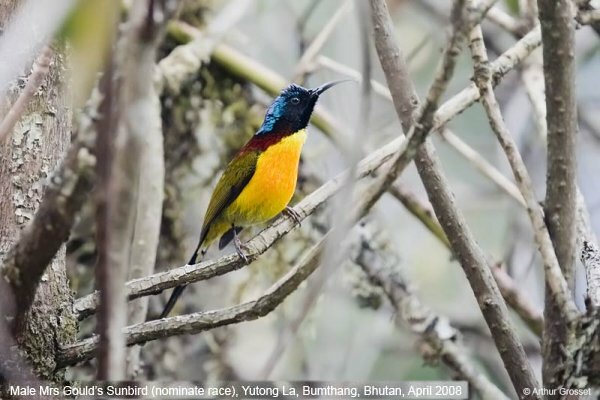 Some sunbird species can take nectar by hovering like a hummingbird, but usually perch to feed. target other species, even if they are not predators, when defending their territories. 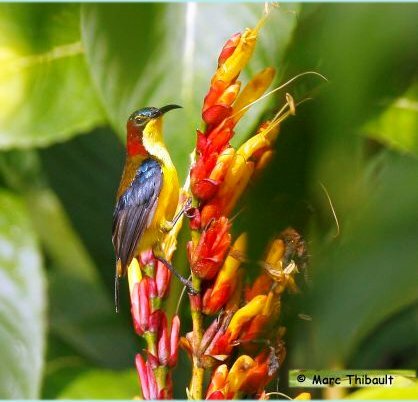 It seems difficult to find information and pictures about those sunbirds. Anyone who can help? Thailand, and Vietnam. 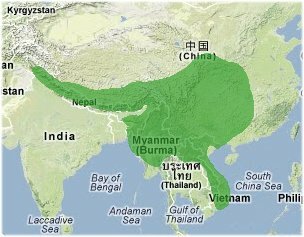 Its natural habitats are temperate forests and subtropical or tropical moist montane forests. In Bhutan it is found between 1,000 and 3,400 metres and we found them mainly in forest with rhododendrons. olive-green, the rump is yellow and the tail is blue. The breast and belly is yellow with reddish streaks on the breast. The female is olive-green with brownish wings and a shorter bill than the male. artist, John Gould and she helped to illustrate many of his well-known books on birds. 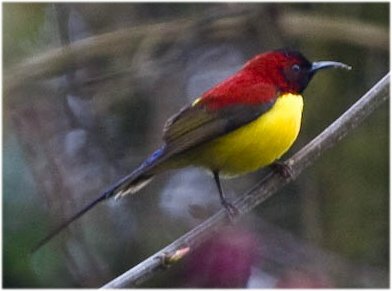 Crimson Sunbird, Aethopyga siparaja, Assam, India. although they will also take insects, especially when feeding young. Flight is fast and direct on their short wings. Most species can take nectar by hovering like a hummingbird, but usually perch to feed most of the time. 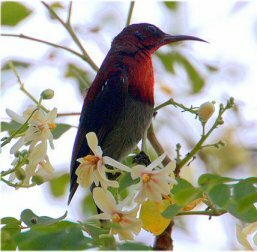 Crimson Sunbird is a resident breeder in tropical southern Asia from India to Indonesia and the Philippines. Two eggs or three eggs are laid in a suspended nest in a tree. This species is found in forest and cultivation. tongues, both adaptations to their nectar feeding. The adult male has a crimson breast and maroon back. The rump is yellow and the belly is olive. The female has an olive-green back, yellowish breast and white tips to the outer tail feathers. feathers. The call is chee-cheewee. 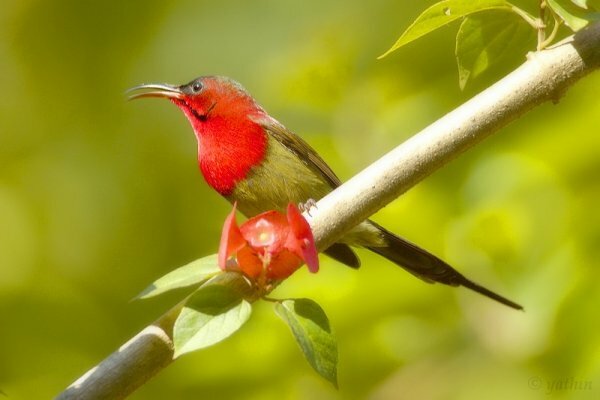 The Crimson Sunbird is the national bird of Singapore.